On Sunday October 1, 2006 a group of almost 60 Wabash students huddled up in 5 vans at 9:45 a.m. and drove to downtown Chicago. 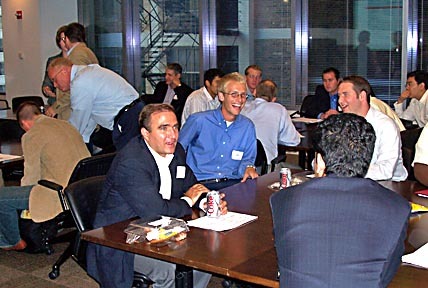 The Chicago Networking Event provided students the opportunity to meet and mingle with Wabash alumni in different career fields. Upon arriving at the Deloitte building in downtown Chicago, students ate a quick box lunch and were introduced to the alumni. After that, the alumni broke off into different groups (of about 2 or 3) and students managed to float from group to group based on their respective interests. In each group students were able to hear the undergrad, grad, and career experiences of each alumnus. Students also had a chance to ask for advice and overall perspective of the alumni. Personally, I arrived in Chicago not knowing what career path I intended to pursue. Having recently decided not to pursue dentistry, I intended to fully utilize the networking opportunity to listen to any and all advice that the alumni had to offer. Although no magic light bulb appeared and hovered over my head by the networking event was over, I left Chicago having gained something essential?the resolve to choose a passion/career path and go after it. Trivial as it may seem, this will be very beneficial to me because it helps take one more difficult steps in the professional/career development process—it moves me from a state of static indecision to a process of working towards the accomplishment of a goal.